Wild: Among the most vocal creatures on the island, Ichthyornis Piscoquus is actually a relatively normal seagull. Living near the beaches, it primarily eats fish, and its distinctive cries can be heard echoing over literally every beach across the island. As you might expect from a seagull, Ichthyornis will flee at the slightest provocation. Domesticated: Ichthyornis surprised me by being a very loyal and social creature, once tamed. It likes to ride on its owner’s shoulder, and bring that person treats (in the form of fish, of course) which its beak-grip enhances with extra healing vitamins. The personality of Ichthyornis reminds me of a housecat hauling a dead lizard back to its family, except bringing extra-healthy fish instead. 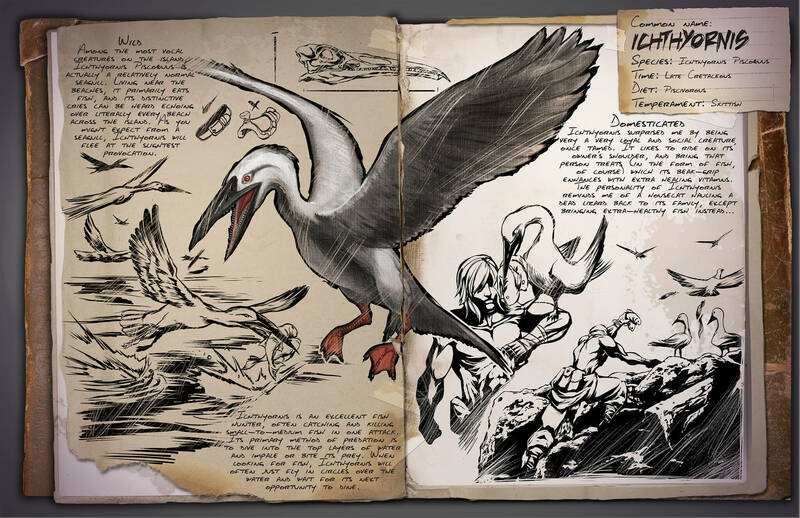 Known Information: Ichthyornis is an excellent fish hunter, often catching and killing small-to-medium fish in one attack. Its primary method of predation is to dive into the top layers of water and impale or bite its prey. When looking for fish, Ichthyornis will often just fly in circles over the water and wait for its next opportunity to dine. The dossiers talks about the Ichthyornis bringing fish to its owner, like a housecat can do with its prey. This might indicate that the Ichthyornis will be another autonomous gatherer, like the Gigantopithecus, but this time for harvesting raw meat / fish.